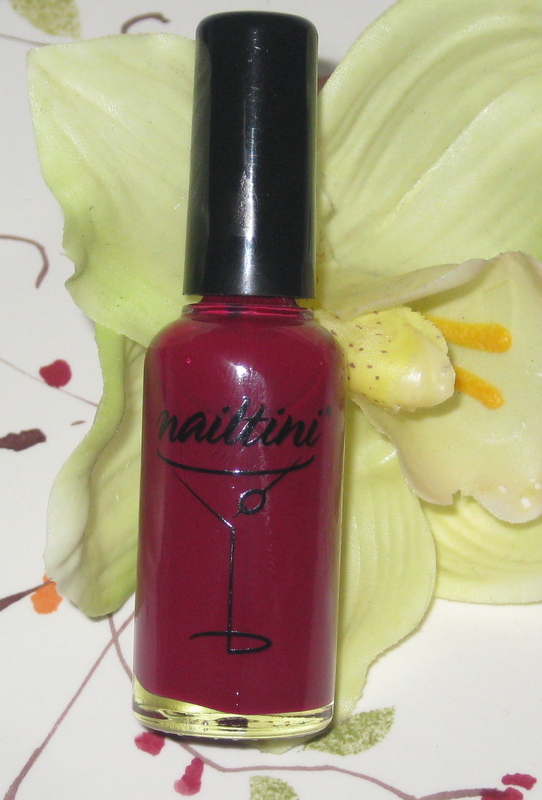 Nailtini Bordeaux Nail Lacquer review and photos. Keeping in mind the wonderful brands Duane Reade Pharmacy stocks, I decided to try yet another nail polish brand. 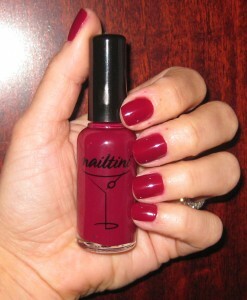 This time I set my sights on Nailtini Bordeaux Nail Lacquer ($13 US/ .5 fl. oz.). This deliciously rich red wine cocktail suited my taste and skin tone perfectly. I envision wearing this color to a holiday party, paired with a black and white outfit, some pearl earrings and the obligatory matching red lip. Oh my, will you look at that…my vision has become a reality. Tis’ the season! Gorgeous raspberry red color…suitable for warm and cool skin tones. Thin formula applies streak-free on the first coat. Two coats were used for good measure. The wear time is fantastic–5 days chip-free (especially impressive for a red polish). The formula is 3-free–no formaldehyde, toluene, DBP. The brush and handle have been thoughtfully designed with the perfect width. Both wider and slimmer nail beds will find application fast and efficient. The amount/price ratio is quite reasonable. Mistakes were easily removable without staining or migration of color. Shiny finish…I always apply a top coat regardless. Nailtini offers 28 luscious color choices. Company offers smaller size version of each color for $6 US. Nailtini offers topper shades and mixer shades to change the look and intensity of the any of the polishes. Adorable martini glass logo complete with olive, printed on the bottles. Nailtini Bordeaux Nail Lacquer nail swatch. No other cons…can you believe? 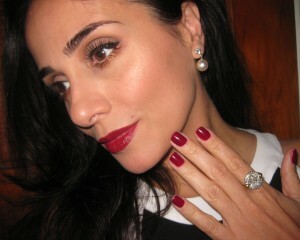 Nailtini is sold in-person at the newly remodeled Duane Reade locations in NYC, beautybridge.com. amazon.com (which is really beautybridge.com), tinibeauty.com, and of course–ebay.com. The company also offers lip stains, lipsticks, eye pencils, etc. Nailtini Bordeaux Straight-Up Nail Lacquer..Can you tell I’m ready for he holidays? Makeup absolutely adores Nailtini Bordeaux Nail Lacquer. The formula, application, color saturation, wear and price exceed all of my expectations. 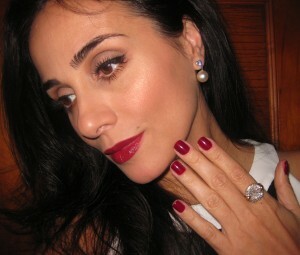 I plan to revisit this lovely shade come December and celebrate the upcoming holidays in-style. Which Nailtini are you planning on getting? Be well and stay safe.